So my sweet Katie had a birthday this past week and my other daughter took her to lunch and to paint pottery. It was so awesome to see two sisters talking over lunch and really enjoying each others company! While they painted, the boys and I were trying to figure out something to do. 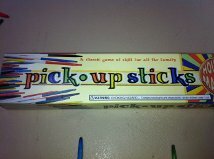 We were all in this indoor shopping place and so we decided to buy the game of Pick – Up – Sticks. One tip….. we tried to play this game on a table, not the best idea, carpet is the best surface to play on. 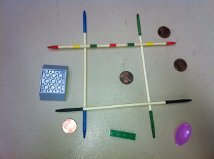 We decided to use the sticks to make a tic-tac-toe board. I have pennies and Lego’s (of course) in my purse, so we were pennies and Lego’s instead of X”s and O’s. Then we had an elementary school lesson in geometry. We made all the different shapes and talked about their angles and sides. So much more fun then a worksheet. 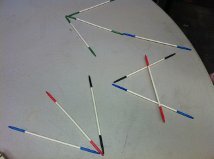 Finally, we all made different letters and shapes with the sticks. I am thankful for the amazing reminder that a stick is still the best toy a boy could have!